With Apple Inc. (NASDAQ:AAPL) and Cirrus Logic, Inc. (NASDAQ:CRUS) holding hands today as they dive into new 52-week lows, how cheap have shares gotten? Answer: Very. Both companies have ridden high together over the past five years, and likewise the couple has fallen without leaving each other’s side. At least they’ve still got each other, even if they’ve both given up substantial gains over the past six months. Starting with the Mac maker, shares now trade at just 9.2 times earnings. That’s almost half of the 17.9 times earnings that the broader market currently trades at. If you back out the $146 per share in cash tha Apple Inc. (NASDAQ:AAPL) was sitting on at the end of December, that figure falls to 5.8. Taking it a bit further, Apple Inc. (NASDAQ:AAPL) has no doubt added even more dollars to its money mountain over the past three months. Even after paying out its dividend and buying back some shares, it’s entirely feasible for its cash position to grow by another $10 billion this quarter (which investors won’t find out about until next Tuesday). Earnings are expected to decline this quarter due to the tough year-over-year comparison. Analysts are expecting earnings per share of $10.13. Apple Inc. (NASDAQ:AAPL) doesn’t provide specific EPS guidance anymore, but based on the metrics it does issue, the company is expecting roughly $9.18 per share in earnings, according to my calculations. Assuming $10 billion in cash added and $9.18 EPS, Apple Inc. (NASDAQ:AAPL) would still be trading at six times earnings (excluding cash). That type of valuation is for companies on their deathbeds, not companies at the top of their game facing moderate deceleration. Even Cirrus Logic, Inc. (NASDAQ:CRUS)’s valuation is in the bargain bin. The audio chip maker’s earnings multiple has now dipped below 8 on its preliminary earnings figures, which were admittedly bad. Still, the company expects gross margin to recover to 50% to 52% next quarter after working through the inventory charges, and its revenue guidance of $150 million to $170 million for the June quarter calls for 62% growth at the midpoint. That level of growth isn’t what most would typically expect from a company trading at less than eight times earnings. The speed bump today will prove to be a short-term lull ahead of a strong product cycle refresh from Cirrus Logic, Inc. (NASDAQ:CRUS)’s biggest customer. When Apple inevitably rebounds on new iPhones and iPads, expect Cirrus to do likewise. Both companies report earnings next week. Cirrus has mostly showed its hand; it probably won’t have any big surprises. Apple, on the other hand, has a lot of uncertainty surrounding it. If iPhone sales are soft and June guidance leaves something to be desired, Apple could easily head lower — further into the bargain bin. The article Apple and Cirrus Logic Are Both Absurdly Cheap at Their New Lows originally appeared on Fool.com. Apple Tablet Sales: Apple Can Rely on PC and Tablet Sales in the Future, Right... What If Apple Inc. (AAPL) Traded Like One of These Companies? 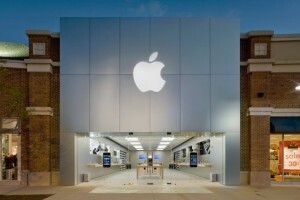 Apple Inc. (AAPL): Calling Bottom Is Dangerous How Verizon Communications Inc. (VZ) Is Aiding the Dow Jones Industrial Average... Apple Inc. (AAPL), Cirrus Logic, Inc. (CRUS): Why Did My Stock Just Die? 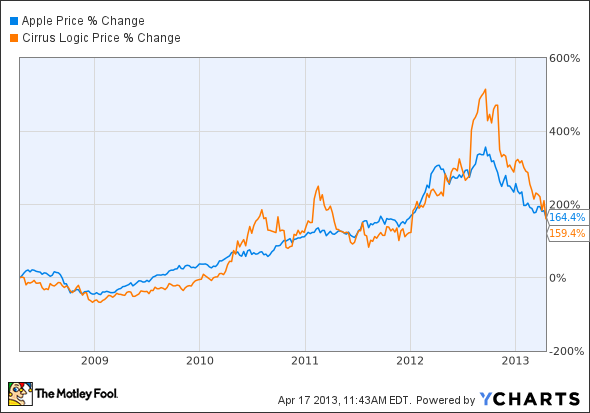 What to Expect of Apple Inc. (AAPL)?